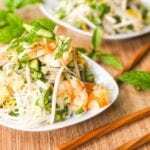 Save time on rolling up those spring rolls and make this deconstructed shrimp spring roll salad instead packed full of fresh herbs and veggies. Tossed with a sweet, sour spicy Asian based sauce. Gluten-Free and Dairy-Free. Perfect for a summer dinner. You know I love to make summer rolls right? I mean I’ve made them dozens of times and shared the recipes a good few times on the blog itself. I am seriously obsessed. They are just so refreshing. I mean nothing is fried, nothing is greasy, heavy or oily. It’s just the freshest crispiest veggies, accompanied by aromatic herbs in generous quantities, soft rice noodles, meaty shrimp, all enveloped in soft and tender rice paper. Then we dip these little bundles of happiness into either a rice vinegar based sauced or a rich and creamy Asian peanuty sauce. I mean is that perfection or what? This quite simply is the right meal for hot summer days. If you’ve got the patience to keep dipping the rice paper into the bowl of hot water and then carefully rolling up those rolls, without adding way too much filling in the process. Sometimes, I simply do not have the patience for such a labor intensive activity. Sometimes I just want to toss everything together in a bowl and have the flavors all there just the same. And guess what, you can have your cake and eat it too, with this deconstructed shrimp spring roll salad. 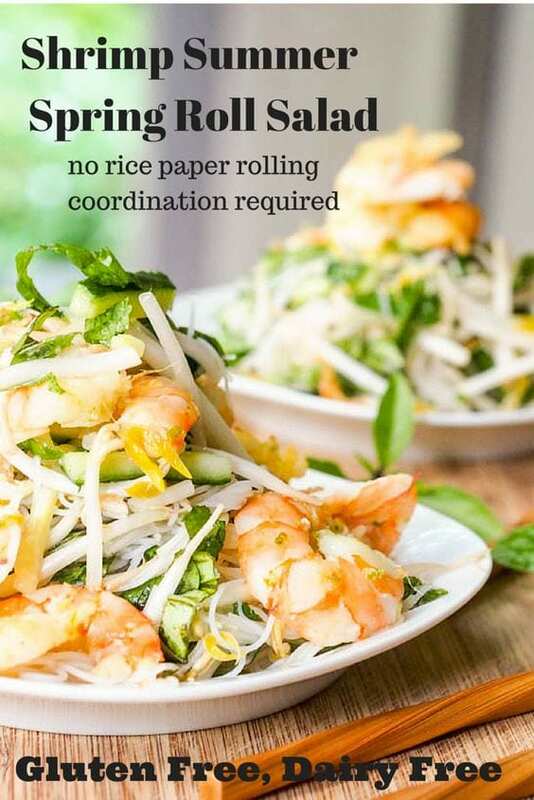 No need to carefully layer all the ingredients on the delicate rice paper. Just carelessly throw everything together in a large bowl, grabs some tongs and start mixing things in. You could even grate the cucumbers to cut down on prep time even further — but I really do prefer when they are cut into matchsticks. They are a bit crispier and don’t get soggy and watery quite as quickly as if you just grate them. I used to make summer rolls with carrots but lately I’m just not that into raw carrots anymore. Something about them – I dunno. They say your taste buds change every seven years right? Well looks like for the next few years raw carrots and I will not be getting along. Instead I opted to add bean sprouts – my new fav. So crunchy and light. YUM. One thing with bean sprouts though — once you buy them you have to use them asap – they spoil super quickly (which is just the worst shame). In this salad you could go crazy and pick and choose your own favorite veggies and herbs. I went with cucumbers, bean sprouts, basil, cilantro, mint, and thai basil. Mix that up, add in some ginger sauteed shrimp and rice vermicelli and quickly whisk up the rice vinegar sour sweet salty spicy sauce. All the taste profiles blended into one. This spring roll salad is hands down my new favorite summer salad. 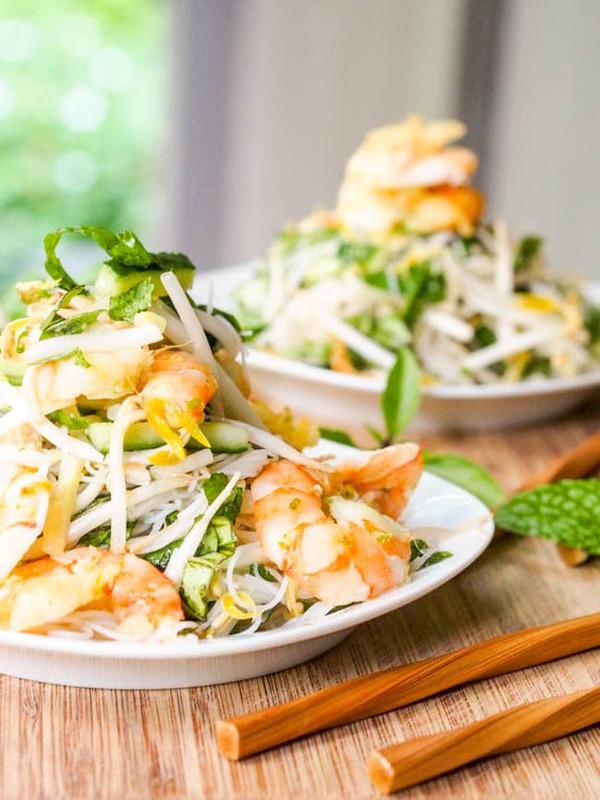 Save time on rolling up those summer rolls and make this deconstructed shrimp spring roll salad instead packed full of fresh herbs and veggies. Tossed with a sweet, sour spicy Asian based sauce. Gluten-Free and Dairy-Free. Perfect for a summer dinner. In a small bowl combine lime juice, 1 tablespoon minced ginger, fish sauce, rice vinegar, agave, sesame oil and 1 tablespoon ginger oil. Whisk until smooth. Heat pan over medium-high heat and add 1 tablespoon ginger oil. Add 1 tablespoon minced ginger and cook until just translucent. Add shrimp, in single layer and birds eye chilis. Cook shrimp for a few minutes per side until cooked through. Mix. Remove from pan. 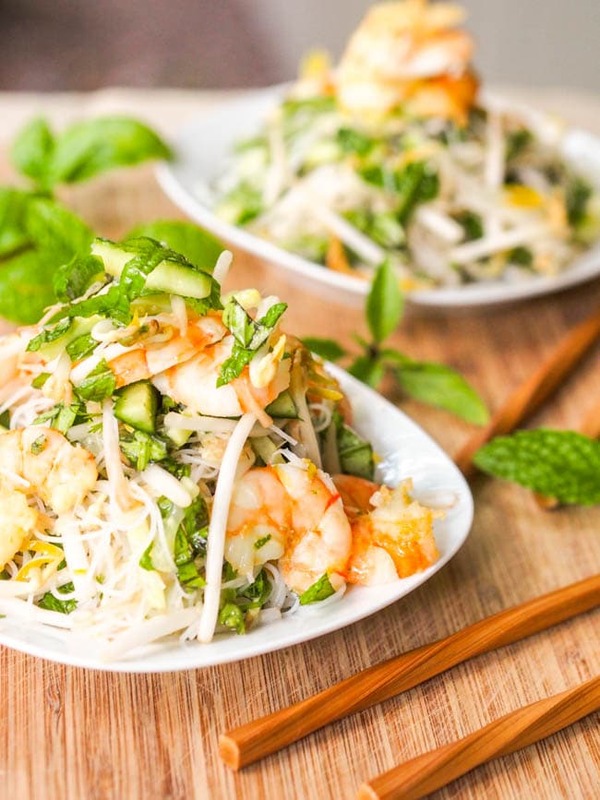 In a large bowl combine rice vermicelli, bean sprouts, cucumbers, and herbs. Toss until mixed. Drizzle sauce mixture on top and mix. Serve topped with 7 shrimp each.